The legend of Nessie – the Loch Ness Monster! Last week, we told you a little bit about Loch Ness, where the Loch Ness Monster, who is usually referred to as Nessie, is supposed to live. But does she actually exist? What evidence is there? In your country what do you know about the Loch Ness Monster? Does your country have a mysterious monster? Tell us about it. Actually, there is quite a lot. The website nessie.co.uk records dozens of sightings over the last 150 years or so, both in the loch and also on the land alongside. There are also a few famous photographs, allegedly showing a monster-like creature in the loch. One of the most recent, which can be seen here, was taken in 2011 and it is claimed it has been analysed by the military in the USA who said there is no doubt that it shows “an animate object in the water.” Could it be that Nessie really does exist? Join us next week for more information on Loch Ness and the Loch Ness Monster. The legend of Nessie has been around for hundreds of years. One of the earliest sightings was on October 1871, when a Mr Mackenzie saw a ‘log-like’ object in the waters of Loch Ness. Since then, dozens of other people have seen ‘something’ in the Loch. But is she real – or just a myth? There are lots of websites dedicated to the Loch Ness Monster. 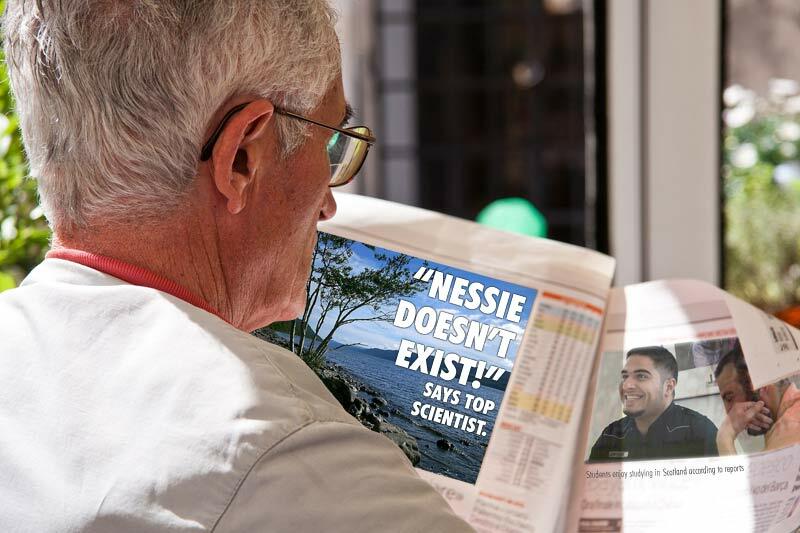 One of the most interesting is nessie.co.uk, from which we’ve taken a lot of information for this blog. Loch Ness is a very large, freshwater lake (lakes are called lochs in Scotland). In fact, it’s so large that it contains more water than every other lake in the UK put together. It is 22.5 miles long and up to one and half miles wide, with a depth of 754 feet. It holds 263 thousand million cubic feet of water and has a surface area of 14,000 acres. In other words, it’s a VERY large place with lots of room for a monster to hide! Professional footballer or pilot? – we get such interesting students at Global School of English in Edinburgh! Matteo Bernardi (pictured here with Scottie the School mascot) is from Rome. He arrived in Edinburgh seven weeks ago to study at Global School of English and he’ll be here for another four weeks. He kindly agreed to meet me recently to tell me how he is getting on and what he thinks about the School and Scotland. Matteo, who is from Rome, originally wanted to be a professional footballer and was pursuing a career with one of the lower league teams in Italy but unfortunately had to give up that ambition when he suffered a bad leg injury. Now, he intends to become a pilot and, as he said, you can’t be a pilot if you can’t speak English! However, you can still watch football, even as a pilot, and Matteo is a huge fan of Lazio (one of the two teams in Rome – “the better one” he says!). I asked why he had come to Scotland rather than go to London. We then discussed what he most enjoyed about Scotland. “For me, the most important thing is how friendly the people are in Scotland. They really will help you, even if they don’t know you. Were there any things that surprised him I wondered? “Yes – people wearing kilts! I went to the airport a few weekends ago and it was full of Scottish rugby supporters, all wearing kilts. My friends in Italy know all about kilts and bagpipes, but don’t understand why a man would wear a skirt! Finally, I asked him about the School – what does he think of it? With the value of the pound sterling (£), this is a great time to study English in Scotland! Especially when 99% of our students say their English has improved after studying with us! The fall in the value of the pound means it’s a lot cheaper to come to study English in the UK than it was a year ago. 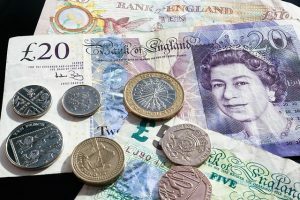 That’s good news for all our students, but did you also know that it’s much more cheaper to study in some parts of the UK than others? Our figures here are taken from these independent, third-party websites, where you can find our much more about the difference in the cost of living between London and Glasgow or Edinburgh. Not only is it cheaper, but almost all our students in Edinburgh tell us that Edinburgh is a very friendly place and that the public transport is very good so it’s easy to get around. They also tell us that the School is excellent. A recent survey by an independent firm showed that 99% of our students say that studying with us has improved their English!